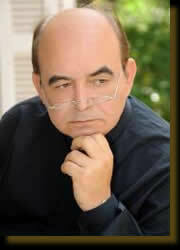 He was born in 1954, in Didymoteicho of Evros, in Greece. From 1964 until 1970, he was a member of the Didymoteicho Municipal Philharmonic band, as a leader trumpeter. Maestro was the late Christos Mandallidis. At the age of 14, in 1968, he began creating his first music compositions and sketches, which are either vocal or purely instrumental. During 1970 and 1974, he studied piano and music composition at the National Conservatory of Northern Greece, where the main professor was Gregorios Damianos. Between 1974 and 1981, he studied medicine combined with his doctoral (PhD) dissertation in the University of Milan in Italy. During the same period, he was attending seminars on orchestration, composition techniques and music aesthetics, at Giuseppe-Verdi Konsevatorium in Milan. Since 1982 (until today) he lives and works in Stuttgart, Germany, practicing general medicine in his private clinic. In parallel he continues to compose music, while furthermore, he has produced two CDs (Shades of Love, 2011 and Return, 2012, both released by "The human voice") and already prepares a third one.